Essendon fans in the 1970s were a different breed. So often accustomed to success, and lots of it, Bombers supporters were unusually subdued back then with their side stuck in the middle of a rare premiership drought. Yet while there was not much cause for optimism on the field, off it, things were being put into place for further success. 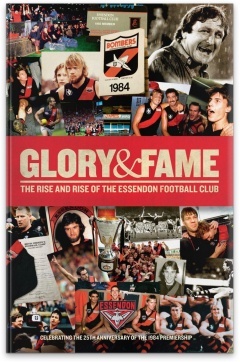 In a series of essays by a collection of Australia's finest football writers, Glory & Fame covers Essendon's rise to become one of the nation's strongest sporting powerhouses. Rohan Connolly reconstructs the rebuilding of the Bombers in four fascinating essays, Glenn McFarlane relives each of the Bombers' four premierships since 1984, and Martin Blake looks at the significant indigenous influence at the club in the modern era. On an individual basis, Tim Watson, Simon Madden, James Hird and, of course, Kevin Sheedy are all saluted, while Paul Daffey recounts the tragic tale of Nobby Clarke, the dual premiership player who took his life in 2003. Together, it's a compelling account of a stunning rebirth of a club. Glory? Tick. Fame? Tick.